If looking to pick up the best equalizer on the market, most experts advise going analogue. Of course, it’s not to say that digital equalisers don’t have the potential to be fantastic. Affordable to buy, easy to use and versatile in the extreme, millions swear by the digital option. Nevertheless, when it comes to truly unbeatable sound quality, the very best graphic equalizers will always be analogue. Whether out to buy the best graphic EQ for live sound or to take things to a higher level in the studio, there are several options we’d advise considering. But what’s interesting in all instances is the way in which buying the best stereo graphic equalizer on the market doesn’t mean having to overspend. In fact, pretty much every one of our top picks is a borderline bargain. First up, American Audio has a longstanding reputation for designing and delivering no-nonsense, all-action hardware for life performances and studio recording alike. 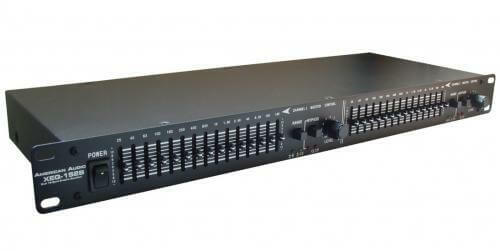 The hugely popular American Audio XEQ-152B 2 channel 15 2/3 octave band graphic equalizer delivers the total package of premium performance and affordability, with 25Hz 16kHz frequency control, selectable 6dB or 12dB control, overload threshold LED (5dB below clipping) and so much more besides. The consistent performance and reliability professionals count on for a generously low purchase price of just £100. Simplicity is the name of the game with the DBX 231s Dual Chanel 31 band 2u Graphic Equaliser, which has been designed to be as user-friendly and versatile as possible. Packed with an array of innovative features that go above and beyond the norm, the DBX 231s boasts 20 mm faders; selectable +/-6dB or +/-12dB boost/cut range for precise gain adjustments; XLR, and 1/4 inch TRS (jack) connectors for installation ease and chassis/signal ground lift capabilities for quick hum isolation. An industry standard equalizer tried and trusted by thousands of elite performers worldwide for a retail price of £179. Last up, the Behringer Ultragraph Pro FBQ1502HD was designed to take the traditional technological standards associated with classic analogue equalizers and bring them up to new 21st century standards. Boasting the brand’s proprietary FBQ Feedback Detection System and industry-leading 4580 dual operational amplifiers, the FBQ1502HD is a state-of-the-art piece of precision German engineering that’s simply unbeatable for this kind of price. Which is just £99, in case you were wondering.